The costume trunk is packed until Hallowe’en. The glitter has been washed off of my face. My sparkly elf-ears are store in their earring box. 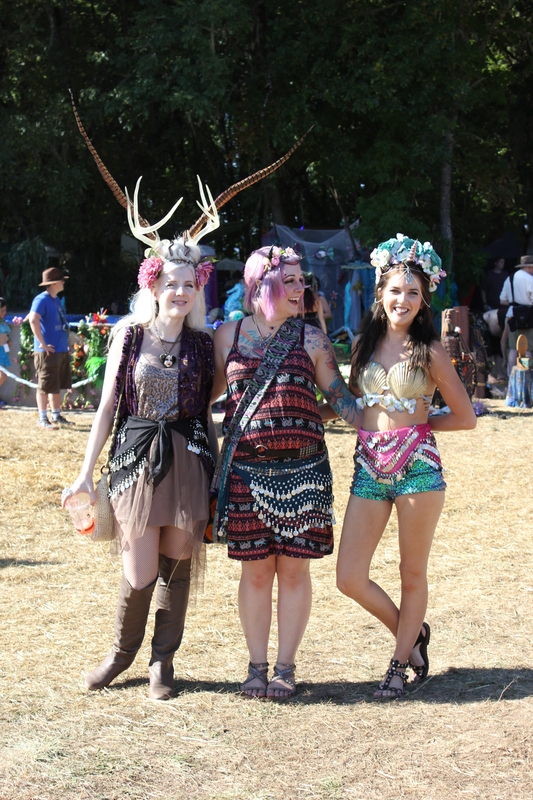 I have moistened my sunburned shoulders and back several times today, and my leg muscles hurt from all the walking we did at Faerieworlds 2014. 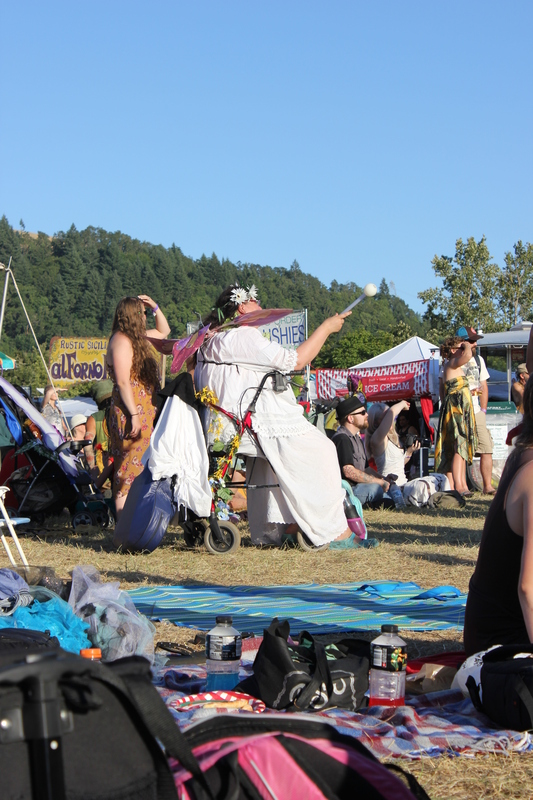 This was the last year at this venue at Mount Pisgah near Eugene, Oregon, and it should have had the resonance of a huge celebration of all that is, and has been, the magical realm of the fae brought to us by Brian Froud. 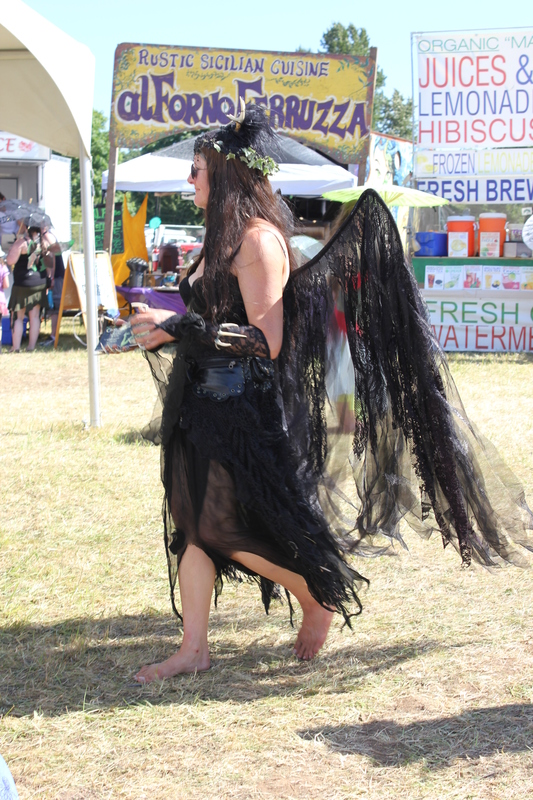 I snapped over 60 photos, so it was not all a loss: there were beautiful costumes and interesting sights, but the magick – the magick was not the same as previous years. The first hint was when we pulled around the corner of Frank Parrish Road and met the first of the volunteers directing traffic. 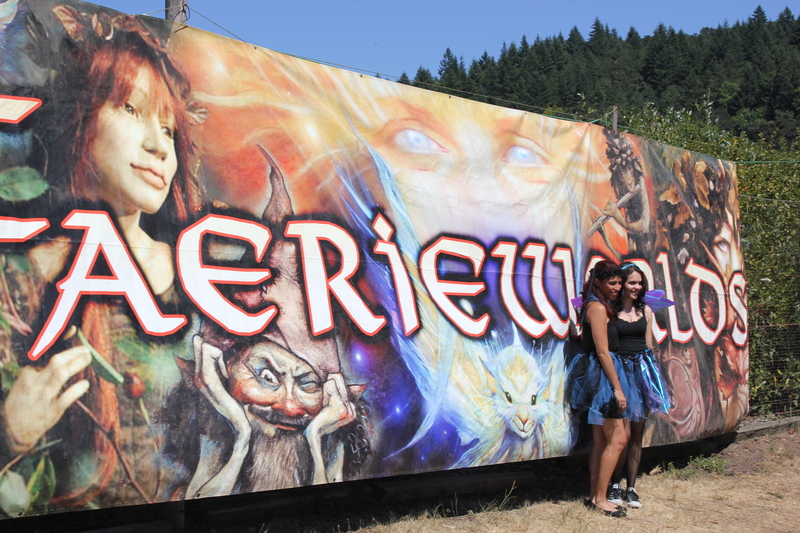 No satyrs, fauns, or Elven maidens met us: only workers in blue tee-shirts and blue jeans. Their faces were not painted in glitter, they wore no crownlets of leaves and branches: they wore a necklace with an ID tag and they waved us along the way as if we were new to the venue. Always before, there has been a genial wave, a cheer of “good fairy” wishes, and magical creatures along the way to guide us. It was the same at Will-Call, for the most part. 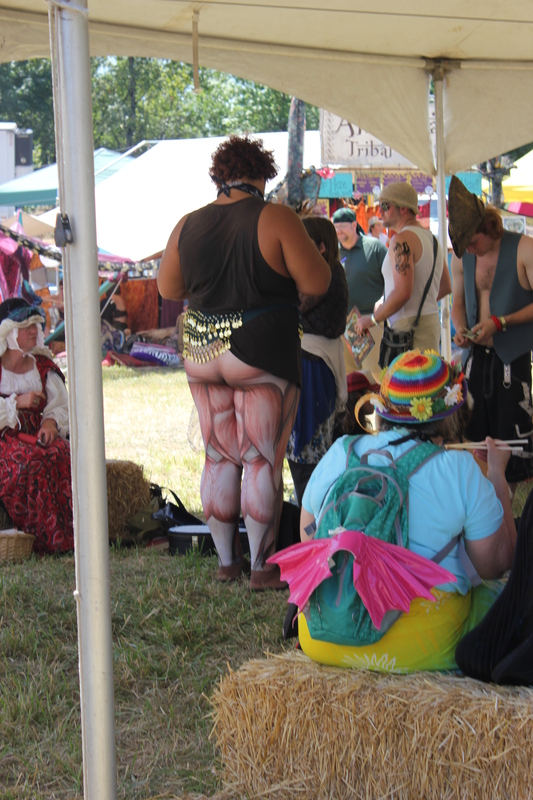 I was glad to be greeted by a fellow actress in full fairy garb, hailed and hugged as an old friend – but the fairies behind the tables were clad in that awful human tee shirt of blue! Faeries here and there still posed for photos, but many frowned upon having their picture taken and I was left to photograph them from behind, covertly. 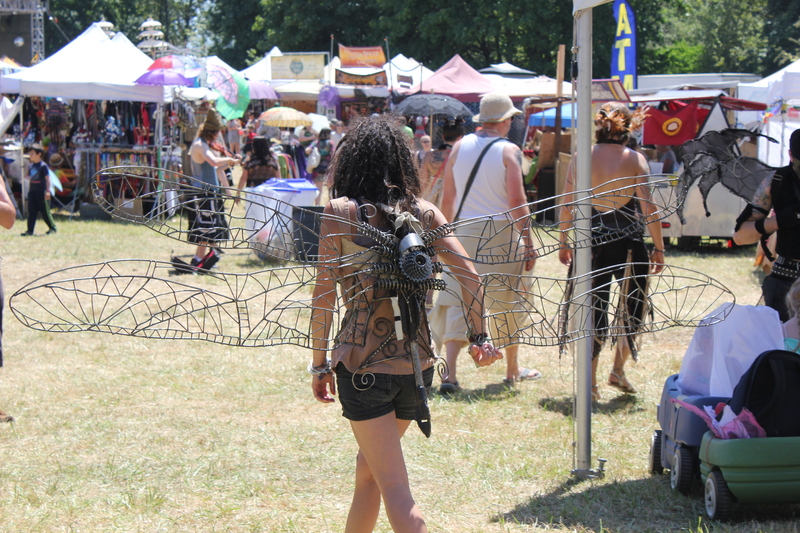 Mechanical wings! Where in the magic kingdom could they come up with such a clever (and non-natural) invention?! 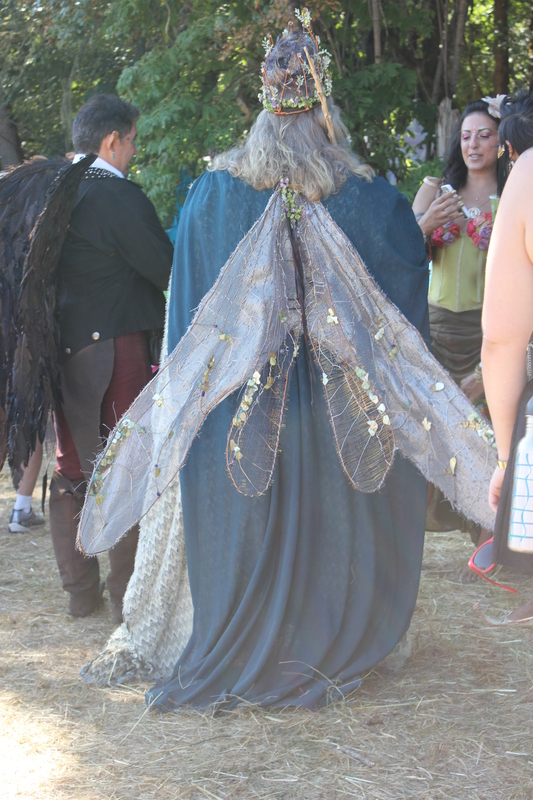 Someone forgot to tell some of the visitors that this is the Kingdom of the Fae, not a Steampunk Con – but I suppose the non-fae have to create wings somehow! 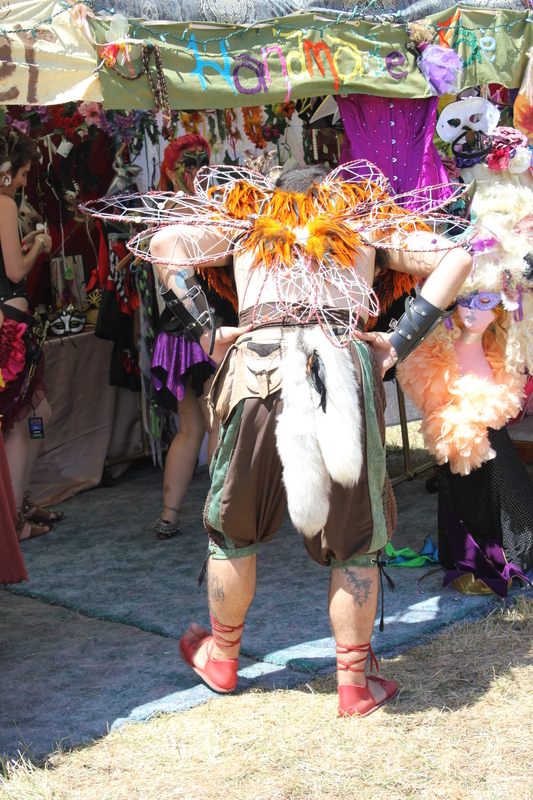 A more masculine set of real faerie wings – and faux fox tails. Or maybe they are real coyote tails. I didn’t ask. I am forever fascinated by the elegance of some wings! 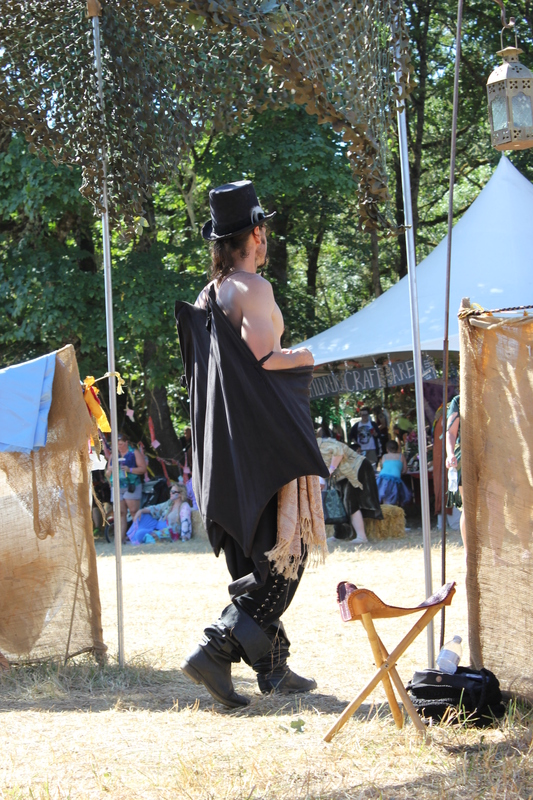 This faerie was more elegant from the side! One of the few veteran actors we saw. This year, there were no trolls or goblins, and precious few actors and actresses making their way around the venue! But always the genial prankster, this Green Man made little kissing sounds at all who passed or gave him compliment! 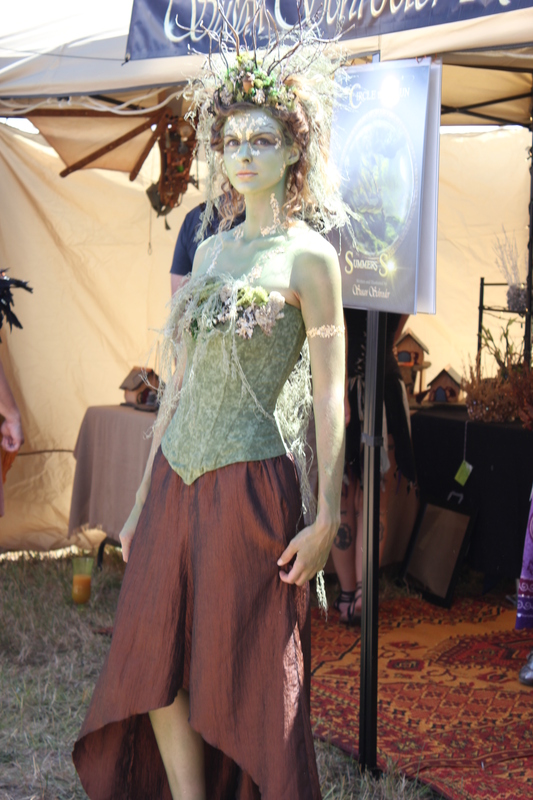 I snapped the phooto of the Dryad and then learned she was at the Faire to promote someone’s book. She was one of the few silent creatures who played the part and walked the walk. I have the bookmark and will most likely download the book onto my Kindle. Yes, I have forgotten the title of it – I’ll add it to the comments on the morrow. Yes! 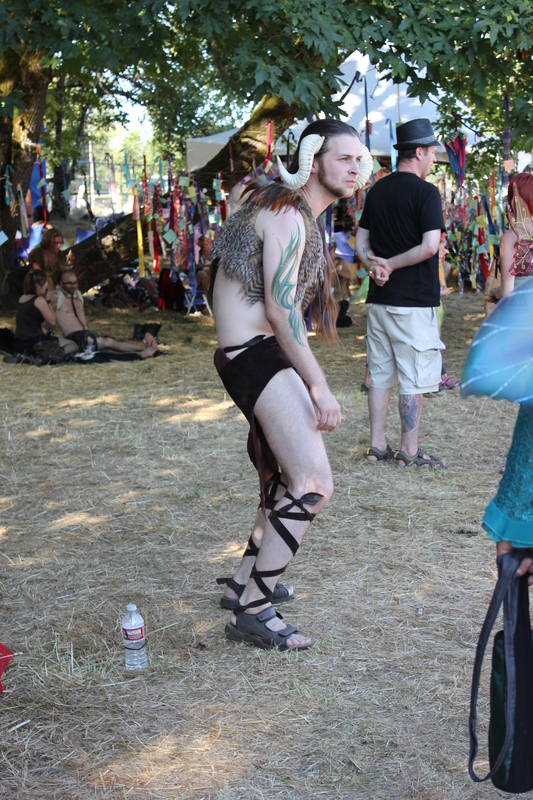 Not a faun nor a satyr, but a horned woodland creature. I saw him later with his lady. The lady was elegant in silver and wings. 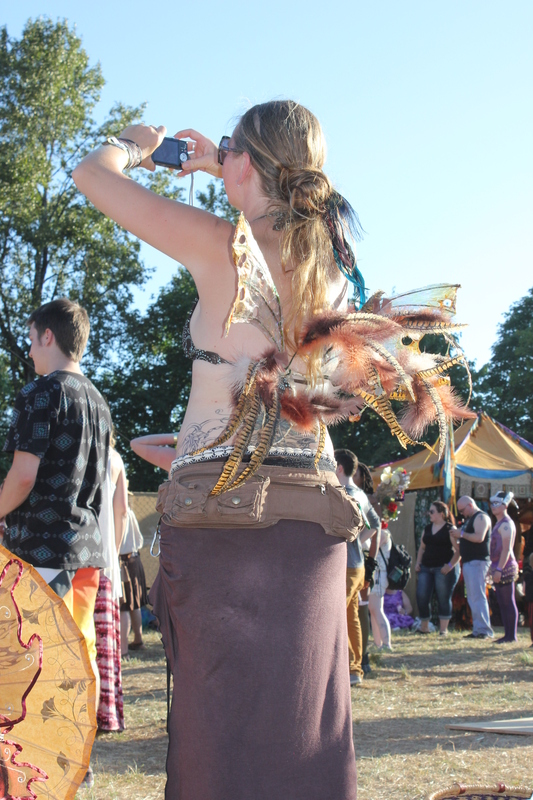 This fae had no wings, but was a snake charmer with her three year old ball python adorning her neck. I love snakes. Some folks cringe, but I find snakes to be mysterious and lovely – this one was perhaps quite happy in the heat of the moment, curling around its mistress’ neck. The jovial bouncer at Oberon’s Tavern – Chrystal said he reminded her of one of the bats from “Fern Gully”. We decided he would not appreciate it and – since we liked him – we wouldn’t tell him. 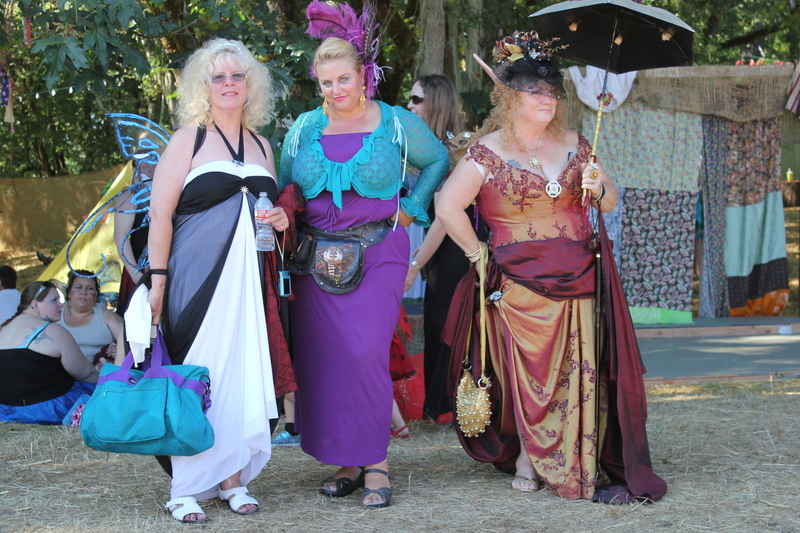 Only a few times could we coax a group of faeries to pose for us. The antlers lit up after dark. Did I mention resting their feet? This actress may not like our review of her performance. She was unfriendly. Her griffon was adorable and active, well-mannered, and clever. But the lady? She hardly spoke to us, seemed a bit put-off when I approached and spoke directly to the griffon, and deigned to tell us a story about him. This is not what we have come to expect. You are an actor in a play. 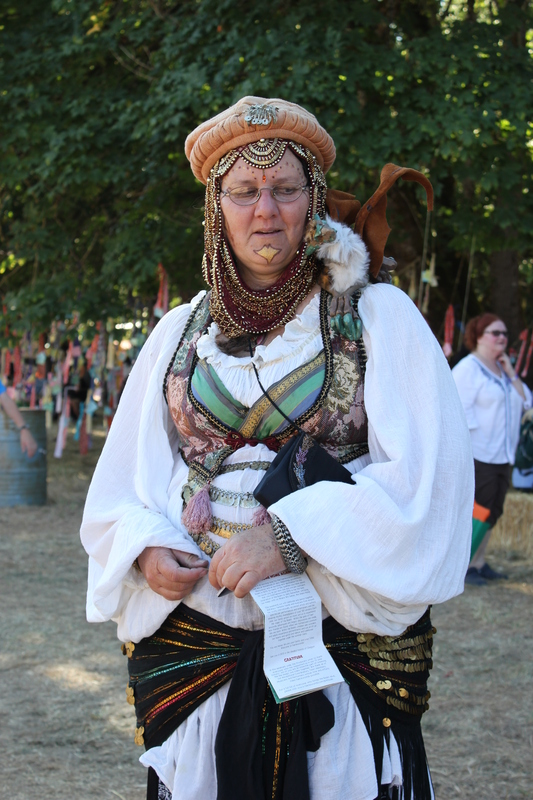 My friend, Mary (she of last week’s Ren Faire), often attends events like this with a puppet-friend who will talk your ear off. If not the puppet-friend, then Mary, who will tell you the history, the ecology, and the biology of her friend. No griffon would be left without a name and without a history of existence! Oh my gosh! 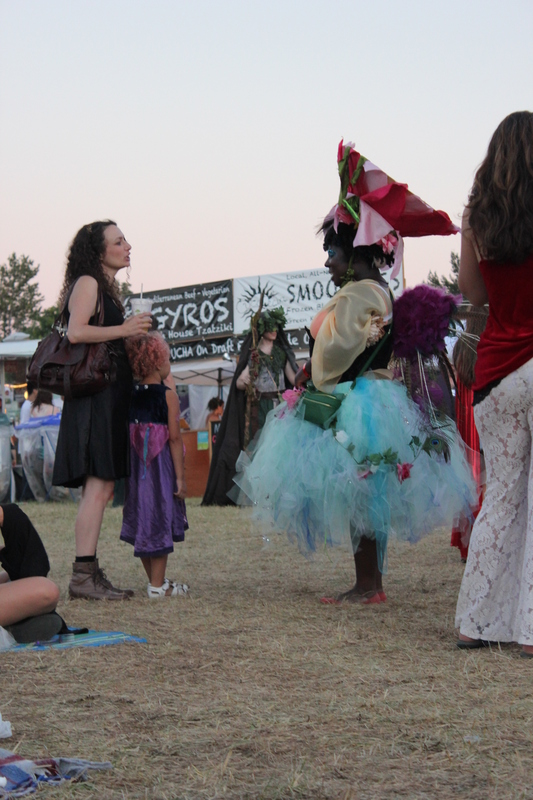 The sugar-plum fairy came out at dusk! Tell me that you do not want to hug that bundle of cuteness??!! 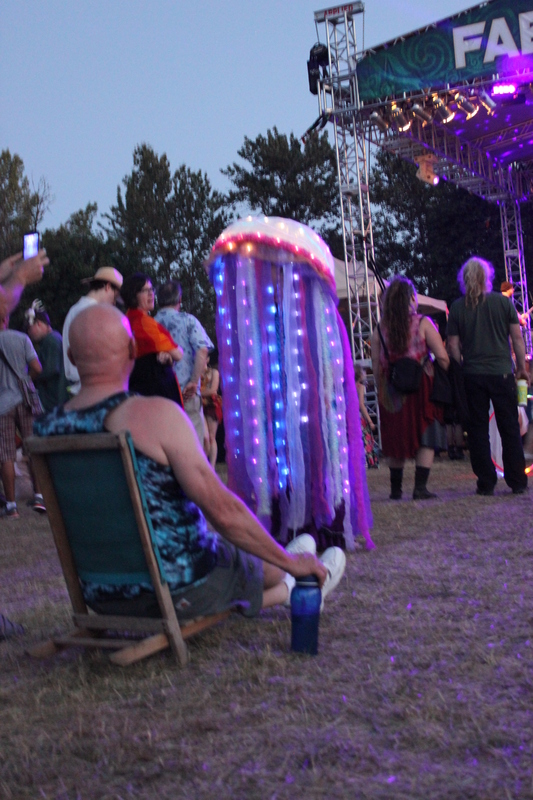 I have seen the jellyfish before – usually, there are several around the faire, but this year, only the one came out, and s/he came out at dusk. It was just as hot last year, so I do not understand the reluctance to engage during the daylight hours, even for an hour. 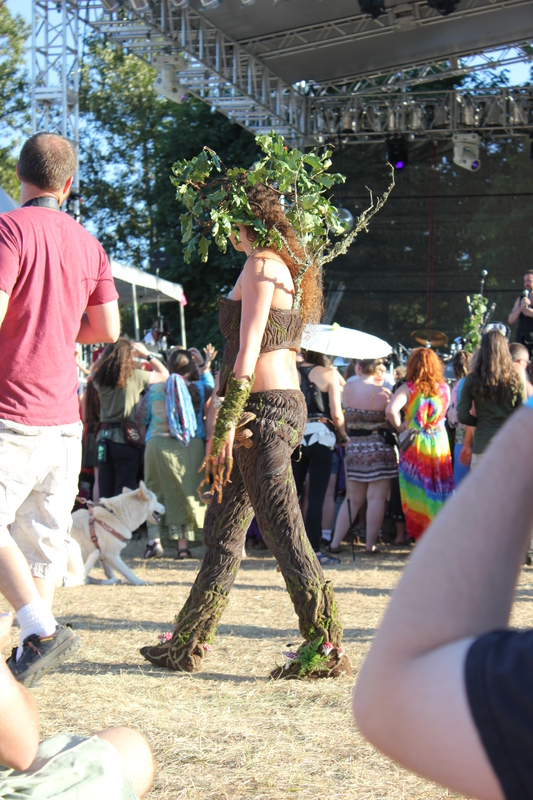 This is what I love best about Faerieworlds – that anyone can be transformed by their imagination into something else. Another photographer filmed her dancing in her wheelchair, and I have to tell you that it was beautiful. This was simply annoying. 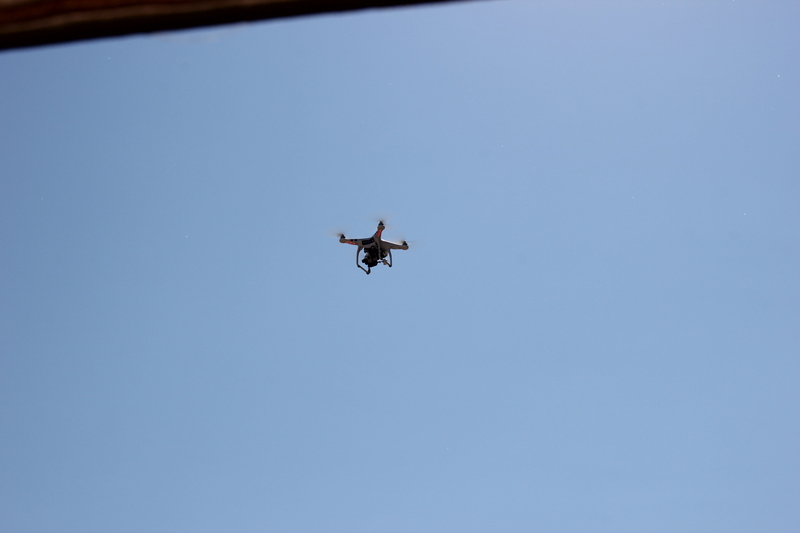 I waved the first time it droned past. It was obnoxious, filming everything and everyone. Granted, when you walk into a venue such as this, changed into another ego, you expect to be photographed and filmed. 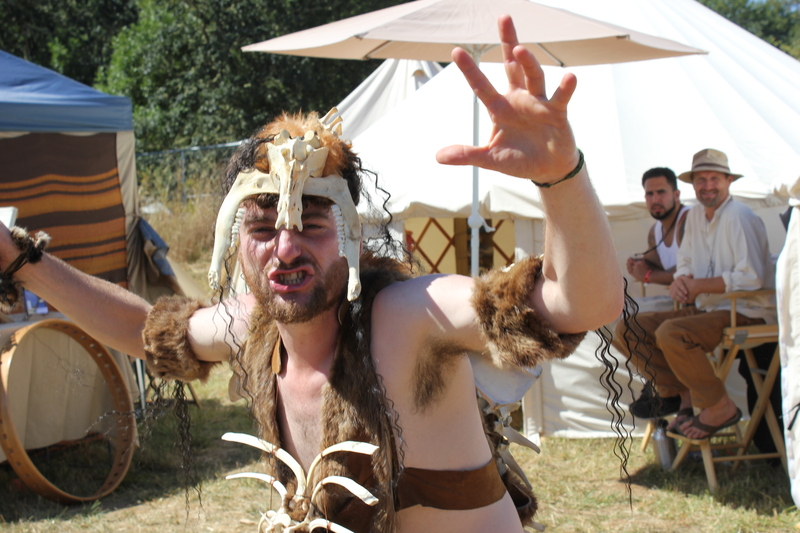 That, of course, was another of our criticisms to this year’s event: so many creatures seemed reluctant to be photographed, and even seemed somewhat hostile. Not hostile like this – but hostile to the idea that you might take their photo and put it up on a blog somewhere, complete with comments. He was, by the way, a very good drummer. She hissed at me, but it wasn’t out of character. 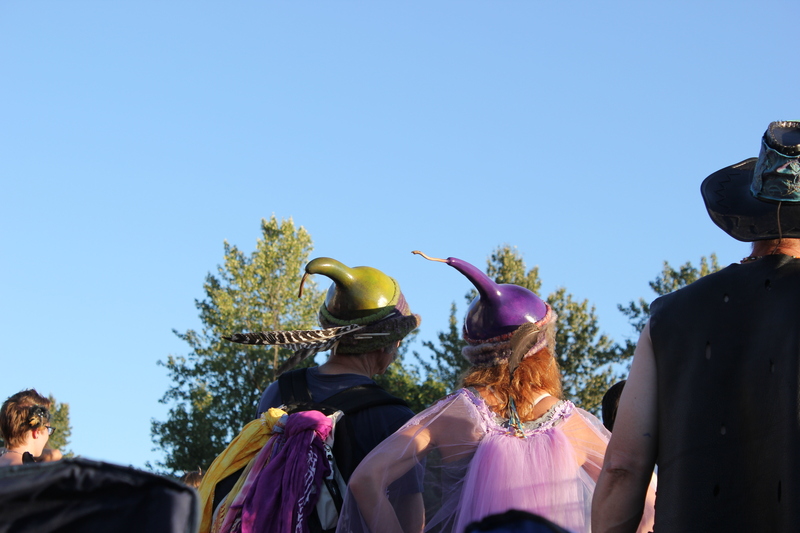 Love the headdress, by the way. Looks heavy and HOT! 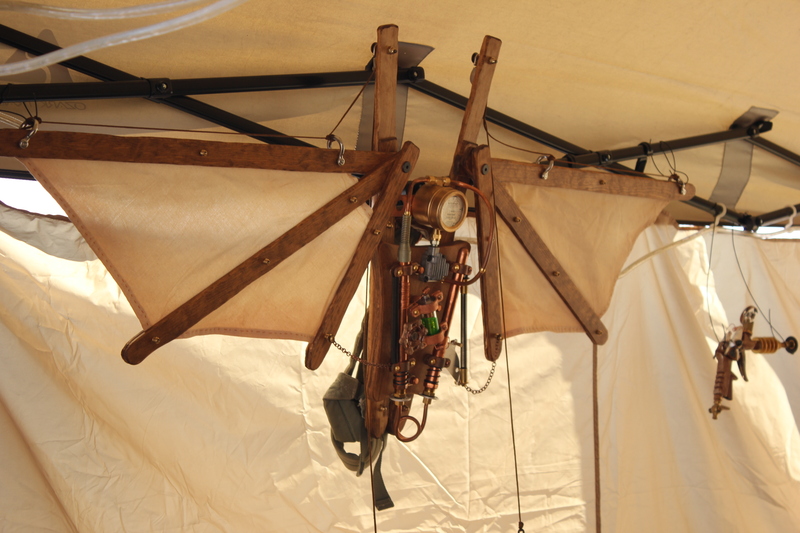 More Steampunk madness in the world of the fae. We were disappointed in the vendors. 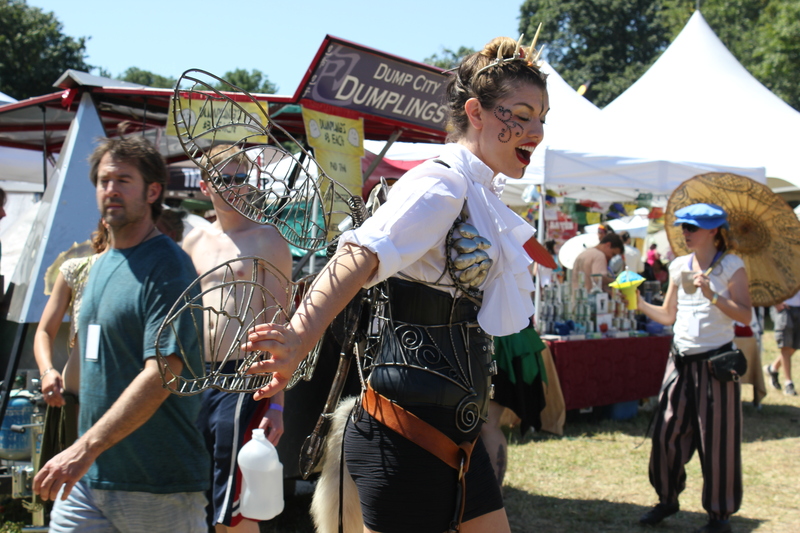 So many of the local, hand-made, and art print vendors were gone, replaced by more commercial vendors. We met one man who was selling hand-crafted items from Mexico, but it was not for a charity. He told us about the women who made the items, but didn’t offer to tell us that the proceeds of his sales would go to help them rise above their living standards. There were numerous rock-and-gem vendors, but since I frequent rock-and-gem shows, their prices didn’t enthrall me (except one – there was one I really liked who had real prices on her wares). The macrame vendor intrigued me solely because I saw her working her macrame loom and I understood those were hand-made items – by the artist in the booth. Same for the wool fairy slippers (I took a business card so I can ask for a pair for Christmas)! 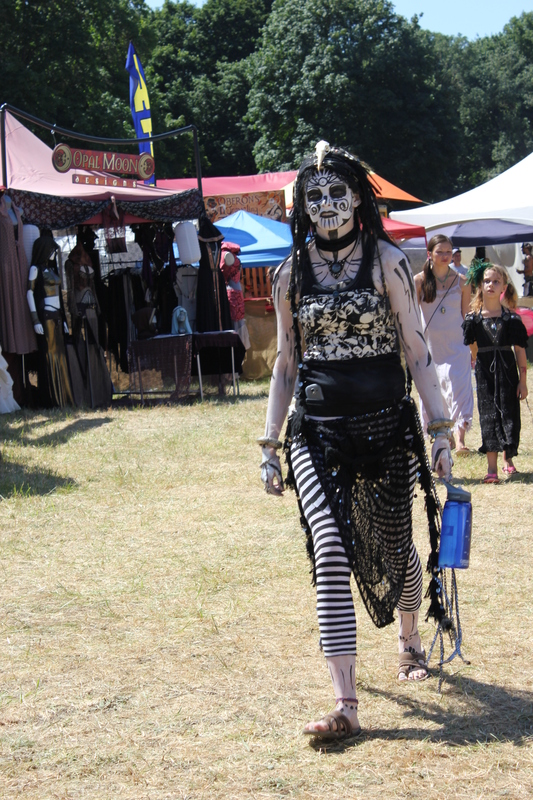 There was a vendor of small vials that was fascinating, and the seller of mummified fairies. 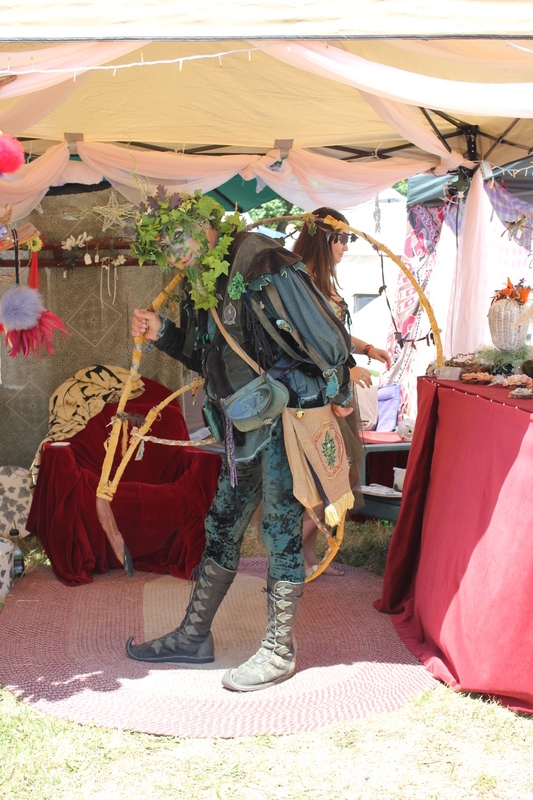 But so many of the fairy booths of the past were gone: the fairy houses, the intricate masks, the fairy ears and animal horns… A few here and there, but almost a sideline to the ouija boards and tarot card readers. It was as if Hobbiton had been taken over by the Dark Lord. 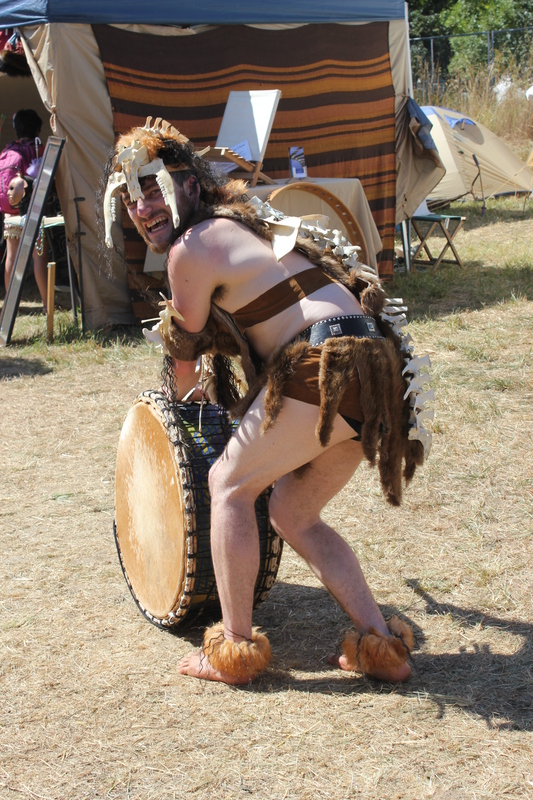 The innocence of the past – of satyrs and fauns, woodland fae, and belly dancers – was replaced with commercialism. Gone were fairy toes and leather-bound handmade books, replaced with – what? I don’t know. It just didn’t have the ring of innocence of the past. Or maybe that is my daughter’s voice ringing in my ears. 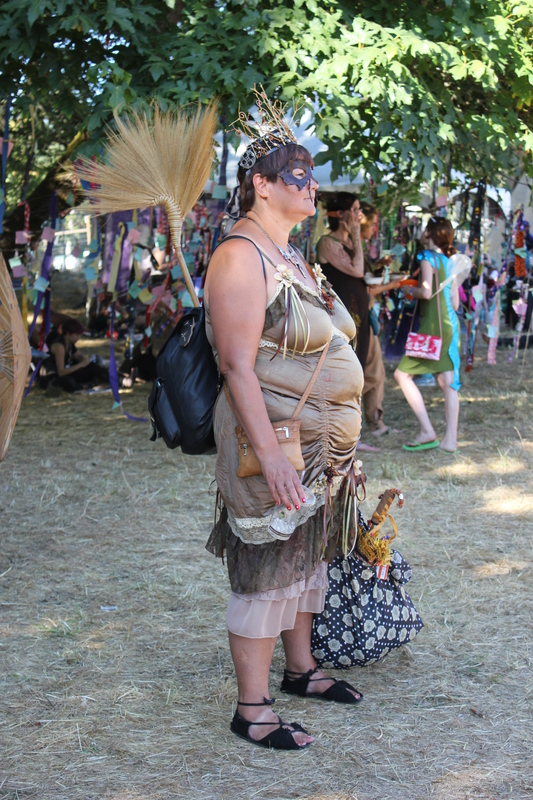 She attended several years ago and returned this year, and she said it no longer had that “magical” feel to it. There were just as many drunks (one hit on her many moons ago), but fewer innocents. The Frouds were long gone and the security guards now wear human clothes in the form of blue tee shirts and jeans. Still, we had a smashing (and I do not mean Wotan the Fairy Smasher) time. It’s sad that the magic wasn’t there. I’m glad you were able to have fun anyway. Thanks, Penny. I hope the magic – the good kind – returns. It’s sad to see a beloved venue fall into the consumerism trap. I wonder if many of the local artists were not there because they could not afford to be? Either because of the vendor fees, or because people did not actually buy their stuff – or a combination of those two? No matter how one feels about an event, when one must invest substantial time and money into it for no return, how can one justify that? Thank you Jim. As you can see from another comment here, the vendor fees certainly played into it. I had considered that, but did not verbalize it in my blog. 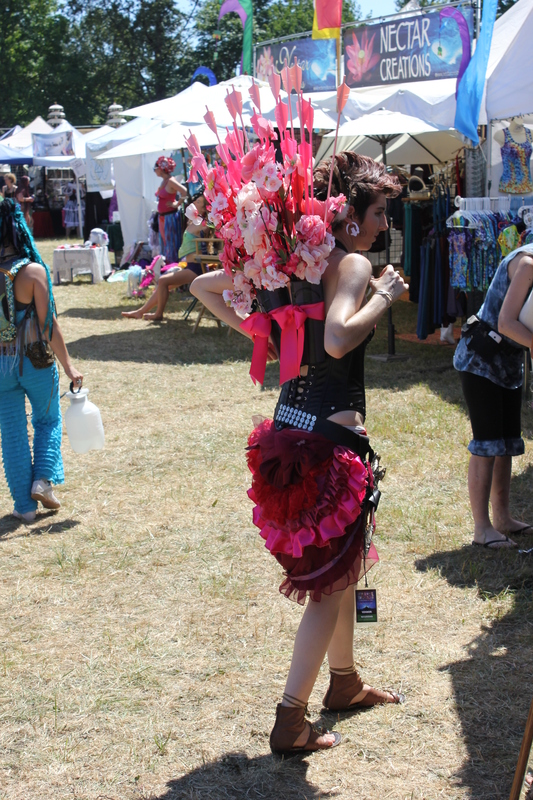 I was a vendor there selling handmade dragon skull masks, dragon barrettes, and griffin barrettes. It was depressing seeing people spending all their money on cheap mass produced trinkets while barely glancing at things they wouldn’t find anywhere else in the world. The show was very greedy when it came to vendors. Each 10X10 spot cost bare minimum $600. 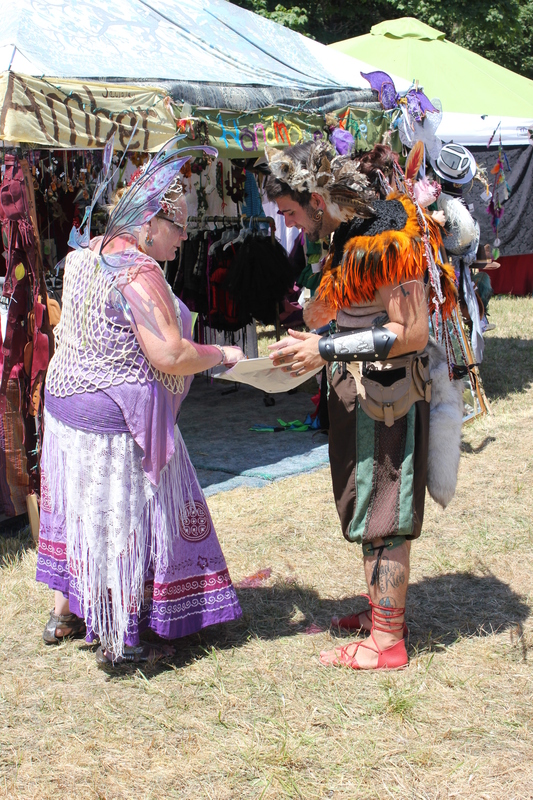 They accepted over 200 vendors. Only 2 that I talked to even made their 10X10 spot money back. 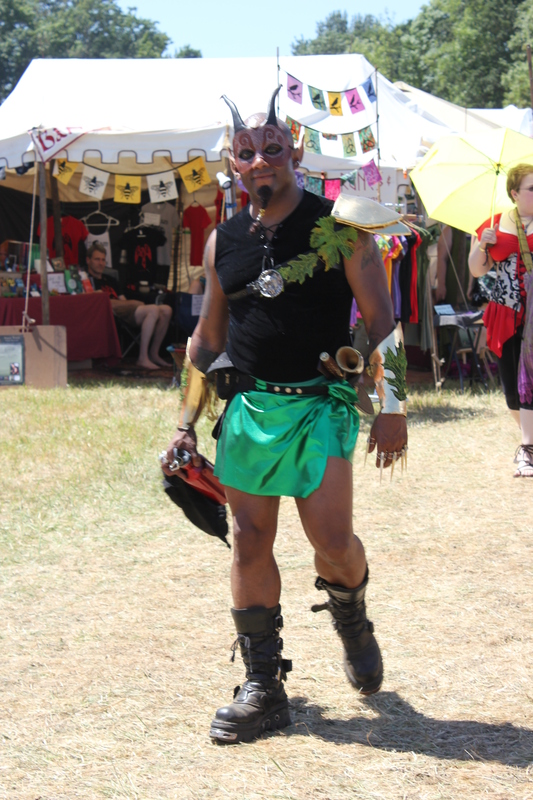 This was my first Faerieworlds. I’ve read so much about previous years, and I was excited for the magical experience. It wasn’t anything like I expected. I’m still very disappointed in the experience. Volunteers didn’t know anything and gave us different information. The staff allowed people to stand wherever they’d like and play music for tips. I even saw people sitting by the food court selling their wares on blankets. The show people lied to us about everything from how many attendants come to how much the average person spends. They set us all up to fail just so they could profit that much more. They should be embarrassed. I probably picked up your business card, Catherine. Your site sounds familiar. I KNOW I did – I almost bought a dragon barrette to go with my gold dragon pinned on the back of my wings. Yours were lovely – and very nearly matched the dragon I have. I can’t find your business card in my stack: do you have a website? I’d still LOVE yo have a dragon barrette (as soon as I get paid). I know I did not have as much money this year as in previous years. I knew they charged a lot for vendor spaces, but did not know it had risen to $600+. 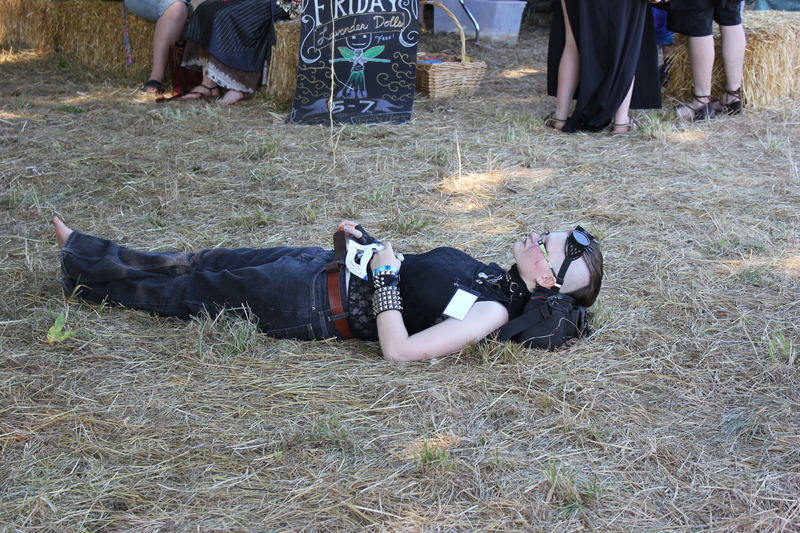 That is exorbitant (especially given that I know how much my friend was spending for her booth at Canterbury Ren Faire the same weekend – although a much smaller venue). I’m sorry you had such a sad experience – even though we were disappointed, we will probably be back in the future (always hopeful). Do let me know about your website. I loved those dragons! 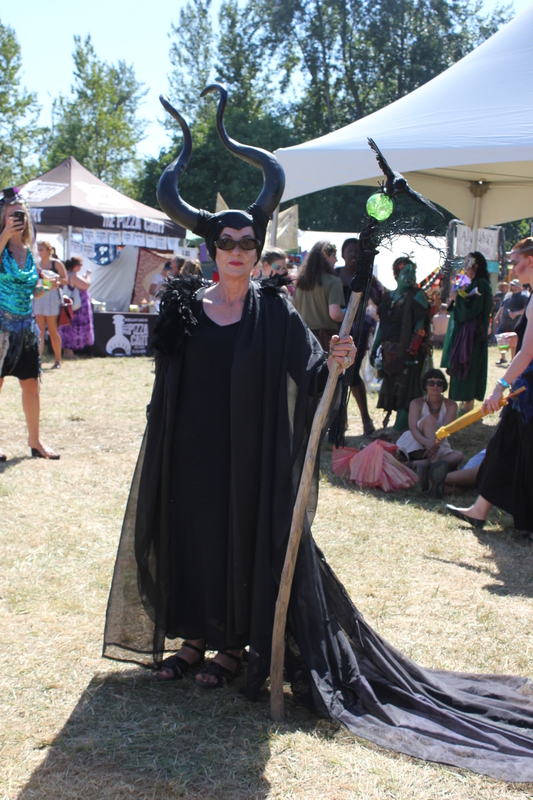 Do not misunderstand me – I found all the volunteers to be helpful, I was just sad that so many were not dressed up as in previous years. It helped me enter into the Realm.